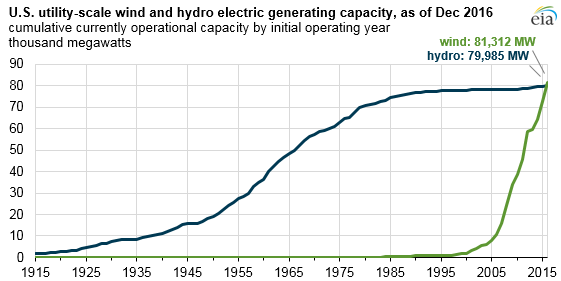 Courtesy of the U.S. Energy Information Administration. Last year, wind energy generation in the United States edged out conventional hydroelectric output, which has historically been the nation’s largest source of renewable energy, the U.S. Energy Information Administration said in a brief published March 6. Wind power now generates 5.5% of the nation’s electricity, four times more than solar power, and enough to power 24 million homes. Five states got at least 20 percent of their electricity from wind last year – Oklahoma, Iowa, Kansas, North Dakota and South Dakota, according to the American Wind Energy Association (AWEA). 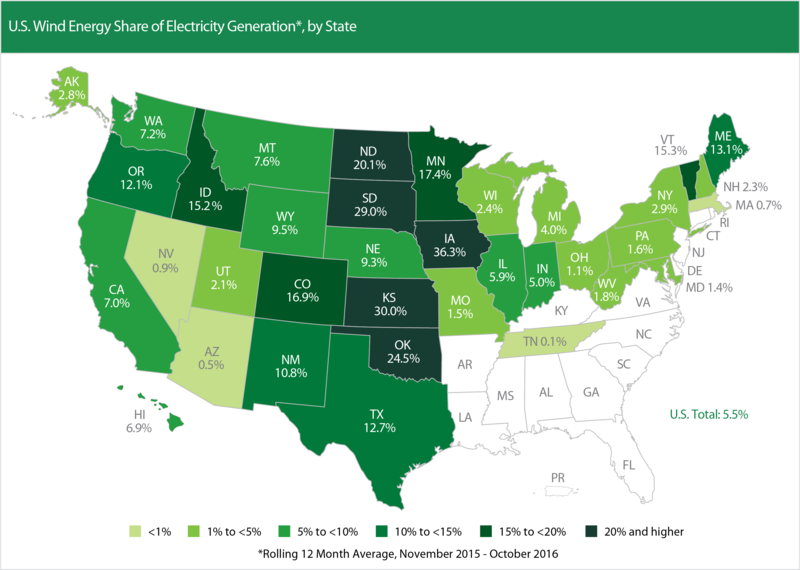 Overall, 13 states generated at least 10% of their electricity from wind, including two northeastern states: Vermont, where turbines produced 15.3% of the state’s electricity mix, and Maine, with 13.1%, AWEA said. Courtesy of the American Wind Energy Association. In Texas, by far the leader in U.S. wind production, the Electric Reliability Council of Texas (ERCOT) system, which covers most of the state, continues to set records for the highest level of wind generation on any U.S. electric system, EIA said. The system set the most recent record on the morning of December 25, 2016, when turbines produced 16,022 megawatts (MW) of electricity, accounting for slightly more than 47% of the generation mix at the time. Another major wind producer is the Southwest Power Pool, which extends from northern Texas to North Dakota and Montana. In the early hours of February 12, wind power supplied more than half of the system’s generation mix for a brief period, reaching 52.1% (11,419 MW). That is considered a first for any of the seven U.S. regional transmission organization (RTO) electric systems that together serve two-thirds of the country’s electricity consumption, the brief said. While wind generation is most abundant in the Midwest, the National Renewable Energy Laboratory found that there is significant room for expansion in the East. The Eastern Interconnection, the grid serving most of the Eastern U.S., could integrate at least 30 percent wind and solar power, the agency said. *Source: North Carolina Clean Energy Technology Center. The EIA brief notes that compared with other electricity generating sources such as nuclear, geothermal, and combined-cycle natural gas, hydro and wind have lower average capacity factors (i.e., generation output as a percentage of total generating capacity). Both sources are sensitive to fluctuations in weather conditions such as droughts, heavy precipitation, and changes in regional wind patterns. You can see data showing seasonal wind generation patterns across regions here. Despite the industry’s gains in 2016, hydroelectric generation is expected to exceed wind production this year, given the hydroelectric fleet’s higher average capacity factors and the above-normal precipitation on the West Coast so far this year, the report said. The Pacific Northwest and California produce about half of all hydropower in the U.S. This entry was posted in Energy, Renewables. Bookmark the permalink.